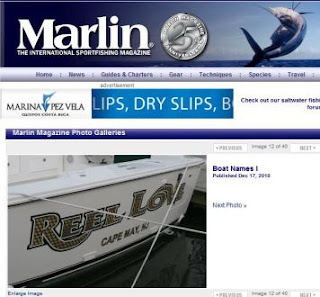 We just checked out the Marlin Magazine photo shoot of boat names, which mostly features big fishing boats, and we found a nice combination of witty plays on words and familiar favorites. If you are looking for a boat name that incorporates the word "REEL" - you know, because you like to fish - then you will find plenty of options in these pictures. In addition to boat name ideas, you also may get some ideas for what color and style lettering to choose for your own boat name if you buy it at one of those design your own boat name sites like CustomBoatNames (our personal favorite, of course). Anyway, here's the spread from Marlin. What's your favorite?